Drain inspections and CCTV drain surveys are a very effective and vital way of diagnosing any blockages or problems. Quite simply, when you find a problem with your drainage, you want it fixed as soon as possible! Not only can the smells become unbearable but it's also a lot of hassle dealing with a blockage at your home, especially during the cold winter months. A CCTV drain survey will speed up everything considerably and diagnose the cause of the problem quickly and expertly. As the camera is lowered into the drain, the plumber will see everything in real time on a TV screen allowing them to find the problem quickly and then repair it there and then. With our drainage expert able to see what the problem is straight away, this inevitably leads to a fast and accurate diagnosis of any drainage problem. Rather than making an assumption based on limited evidence, they will be able to devise an effective solution for the problem. For example, if a large object like a tree root is blocking the drain, a chemical cleaner or something similar will not flush it out - a drainage expert will know this from the CCTV footage. Repeat visits to sort out a drainage problem can often become expensive. So it's important to make sure that you save money wherever possible by having a CCTV drain survey carried out. Due to its accuracy and precision, a CCTV drain survey offers value for money because it simply takes less time to find and diagnose a problem if there is one. While saving money and time, CCTV drain surveys also keep disruption to an absolute minimum. The CCTV camera does all the work in locating and diagnosing any problem, so once we've identified it, we'll carry out the work on that part of the drain. We'll do that rather than carrying out a full-scale excavation to locate the problem. If you're buying a new property, it's important to have the drainage systems checked and analysed before you purchase. A CCTV drain survey can be used to carry out an assessment of any drain in a property and turns what could be a long and expensive task into a quick and accurate visit. It will also cut down costs during the expensive process of buying a home. So why not have a CCTV drain survey carried out today? If you think you've got a problem with your drains, then have it quickly diagnosed by a CCTV drain survey. 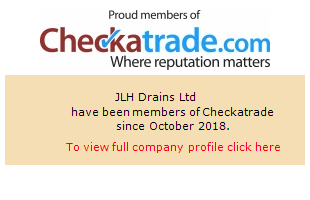 At JLH Drains, we work throughout Kent, Medway and London, providing first class and highly accurate CCTV drain surveys for very affordable rates.